Spotify isn’t the only music service that’s tied into the Facebook Music dashboard, but it is one of Facebook’s biggest partners, so it’s likely that a huge chunk of your Facebook friends will be using Spotify. However, Spotify-related activity may not show up on the Music Dashboard if you’re logging in from a country in which Spotify doesn’t operate. Top Songs: At the top-right of the page, you can see the most popular songs that your friends are currently listening to. If a number of your friends have listened to a particular song, then that song shows up here, too. Trending Albums: See what music people are playing on Spotify and other music services. Below an album name, click the link that says See x More Songs (with x being the number of additional songs that you can display) to expand the list of songs. Music by Artists You Like: Facebook recommends music by artists whose Facebook pages you have Liked. Have some fun experimenting with the links you see on your Music dashboard, seeing where they take you, particularly because the Music service is still evolving. Clicking an artist name next to a track, such as Stevie Wonder, takes you to his musician page. 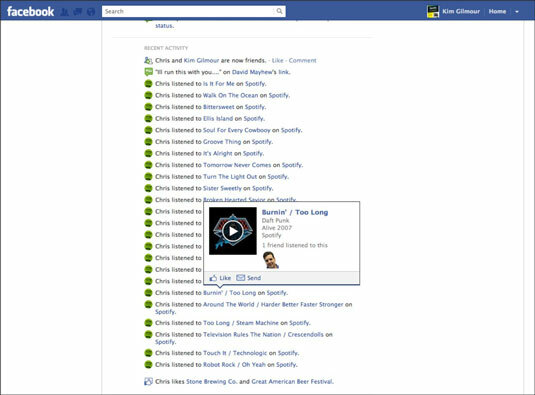 And if you hover over a link, a pop-up window appears in Facebook relating to that track or artist. Whenever you see a Play button on any Spotify track in Facebook, just click it to play the music in Spotify almost instantly. You need to have Spotify open in order to play tracks via Facebook — a Spotify music player isn’t actually built into the Facebook website. But the good thing about this setup is that if you leave the Facebook website, the music keeps playing. So, whenever you see a post on Facebook, such as Chris Listened to “Around the World” on Spotify, just click the Play button next to the notification to launch the track (hovering over the track and clicking the Play button in the pop-up window that appears should also work). The Music dashboard isn’t the only place from which you can play tracks. If your friend listened to some songs, then that information might appear in his Timeline or on the real-time ticker. You can hover over a song title to open a pop-up window, which displays more information about who sings it, as well as any related album artwork. Click the Play button in the pop-up window to launch the track in Spotify.